Yes, that is the correct interpretation of the camp in Lysimacheia. It also blocks LOS as a fortified camp would. It is just a bunch of tents really, that are a hindrance to the occupiers, caught in the act of looting! Well talk about head to head train collision. After a couple of quick skirmish plays, both sides closed in on each other with Gallic hitting first. They saw some success (1 banner) and gravely weekend the Greek line, but the Greeks were holding the clash of shields and quickly scooped up 5 banners on the next play. Alexassandro, to his credit, didn't blink and came back on his next play and evened it up....it was a clash royale! 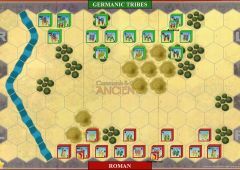 However, the die was cast and the Greeks had may choices of picking up the last banner from the largely reduced Gallic units...and did. Fun and quick scenario. 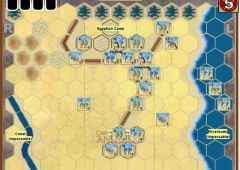 The Gallic Bolgios moved to the left flank to utilize a Leadership left flank card. The Macedonians line commanded forward. 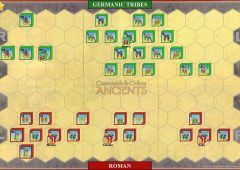 The Macedonians double timed heavy infantry and medium infantry into Gallic center eliminating 2 screening chariots units. 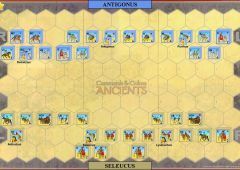 Gallic army used leadership left to attack the isolated right flank of the advanced Macedonian line eliminating a Hvy Infantry and severely wounding a 2nd Hvy infantry. 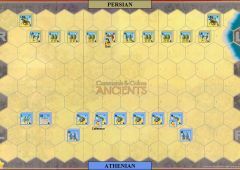 Ptolemy advanced again and traded a single unit for each side but then was left alone and weakened. Medium Command surrounded Ptolemy and attached Heavy infantry and both the unit and leader were eliminated. 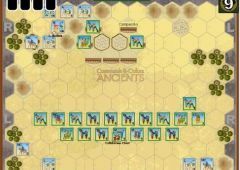 Macedonian counterattack eliminated another Gallic unit and then Clash of Shields eliminated 2 Macedonian units to end the battle. A very quick game. Giulio played well and I'm glad he has joined the tournament. This game took us almost 3 hours to play as neither of the sides was too keen on moving forward. Instead, a lot of blocks were lost due to range combat. 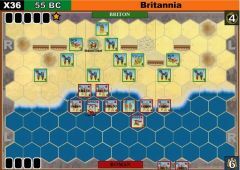 Epirote tried to break Carthaginian centre, however, without much success. 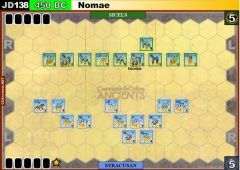 As a result of two attacks in the centre Epirote lost two of his leaders, which made it rather difficult for him to secure victory in this battle. 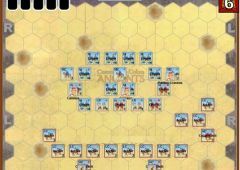 Very close battle, went back and forth when the main line of Macedonians engaged and Warriors and Medium Cav responded. 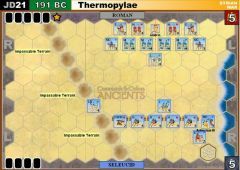 In shortest game in history, a Double time followed by Line command sent the Greek hvy Inf crashing into center of barbarian line that had no leaders. Togan only got one card off. Greek marksmen shot up everything they shot at. Carthaginian bowstrings must have gotten wet. 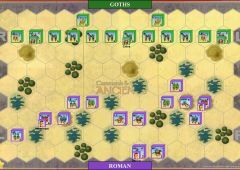 Then Hvy Greek middle went up center right as 2 Carthagenian generals and inf moved up on Carthagenian right. 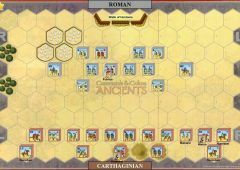 Greeks had great cards and dice and a First Strike that killed a 3 pt Carthagenian HC, insult to injury. My thanks to Michal in braving the slings and arrow of outrageous fortune. Adding the logfile from our game. Tough game for Macedonians - after some re-positioning, the attack in the center collapsed, HI was erased together with only leader. The is was just finishing of the Greek army - first on their left (Chariots) and then in center (by Warriors). Pars really cannot do anything else, the cards and luck (finally!!!) was on my die. Last edit: 1 year 5 months ago by mk20336.